The effective use of Data Analysis allows for far greater insight into risk and control issues, while reducing the time required to analyse transactional data. 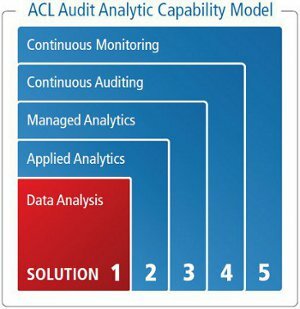 The ACL Data Analysis Solution helps audit teams work more efficiently to get more done with their existing resources. Analysis that would have often taken days to complete can now be done in minutes. Easily perform Data Analysis prior to commencing an audit to prioritise resources where audit issues are revealed. One of the keys to improving performance and driving better results is the ability to automatically record what has been done and reliably repeat it – strengthening the quality and consistency of audit work. ACL provides comprehensive audit trails and reliable task automation – from accessing the data at source, to verifying its validity, to generating audit reports. By taking advantage of the ACL’s Data Analysis solution to analyse transactions, you can do much more than just sample a data population, ensuring 100 percent coverage and the utmost confidence in your results. Gain visibility into your organisation’s information through the ability to directly access and query each and every transaction – from a multitude of sources and systems. Based in Las Vegas, Caesars Entertainment is the world’s largest gaming company. Caesars owns or manages nearly 50 casinos and gaming facilities in 12 domestic (USA) jurisdictions and five foreign countries with over 80,000 employees. Caesars has applied ACL to move beyond random sampling and gain full data coverage on a variety of operational and procedural analyses. Auditors can quickly perform complete assessments and spend more time investigating only the exceptions. With full coverage also comes greater confidence in the company’s regulatory reporting. Staff auditors feel more comfortable that their work with critical data is accurate and comprehensive. With ACL, manual tests that used to take two full days, for example, can now be performed in 20 minutes. Operational auditors have recommended effective changes within the company, and team members are better equipped to maximise their time and talents.